You May Be Broke If. . .
September 4, 2016 September 3, 2016 Categories Humorbroke, Cheap, Funny, Humor, Lifestyleblogger, Money, Thriftstore, Thrifty11 Comments on You May Be Broke If. . . There are few things in life that I consider myself a true authority in. Vanilla shakes, sarcasm, and keeping self-entertained are examples of such things. But when it comes to being thrifty, saving money, and—yes, being broke—oh, my wisdom reigns supreme. 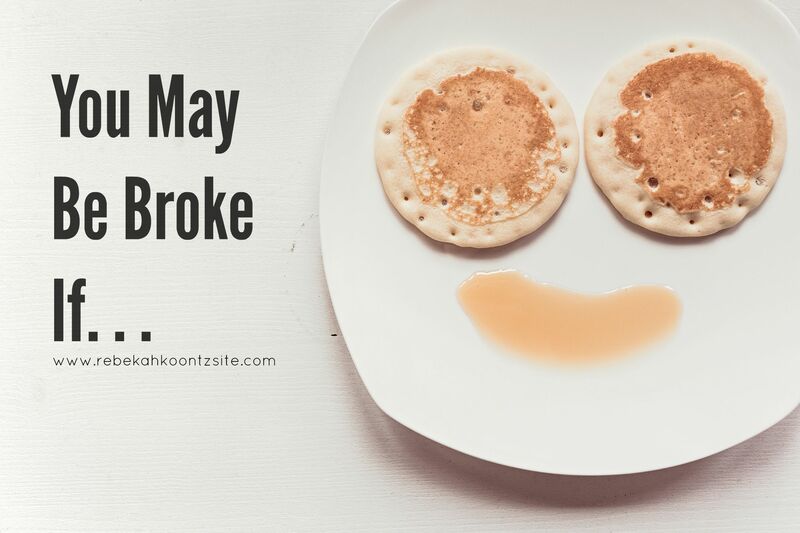 For example, you may be broke if. . .
1. You wait for the thrift stores to have a sale. 2. You’ve ever thought back to a careless purchase you’ve made, and regretted not having the money you could’ve had if you just didn’t get that extra whipped cream on your Venti Caramel Frappe in 2013. . .
3. When someone asks you for a piece of gum, you take a stick and rip it in half, give them half, and chew the other half yourself. 4. You’ve attempted to at-home dye/style/cut your hair. 5. You’ve attempted to tailor your own clothes. 6. You’ve held up a line of angry people at the store because you paid in all coin change, and it took you a while to count the pennies. 7. Del Taco’s $1 iced coffee gives you a thrill. 8. You watch haul videos on YouTube because it’s kind of like buying the items yourself—without the tears. 9. You never accelerate your car too quickly, to save gas. 10. You’ve used a sharpie to color in the scuff marks on your shoes, or tape to keep the soles in place. 11. You sneak snacks into the dollar movie theater, because their candy is way overpriced. So now I think the real question is, on a scale of 1 to 11: how broke are you? Hahaha number 2 is SO ME. It’s usually with clothes I’ve only worn like one time though – so. much. regret. Isn’t it the worst?! I just stare at those items, hating in my heart and thinking about all the cherry slushies I could’ve bought with that money. Haha your posts are always so creative and funny. I couldnt stop laughing at number 10. You know that is a pretty darn good idea. I love this ! I can relate to a lot of them. Haha yaye! Thank you for reading (sorry that you’re broke like me😂). Haha I am definitely currently broke! I don’t even use the Air con in my car to save on gas haha! I also always take my own popcorn to cinemas ….